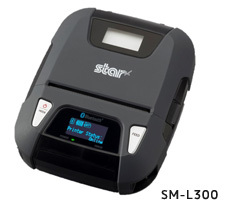 STAR MICRONICS CO., LTD. (“Star”) releases the SM-L300, the 3-inch portable printers, to start the sales from April, 2017. The SM-L300 is the new mobile printer which is designed based on the concept of Low-Energy and Low-Voltage, inheriting basic features of the SM-L200 released in 2015. It is suitable for the mobile POS system using smartphones or tablets. In addition to the main features of this L series such as BLE communication (for iOS) and 5V charging which is used for smartphones, the SM-L300 provides a variety of media support including label support, sticky paper support and variable paper width (40 ~　80mm) support, so it can be adapted to various use scenes. The SM-L300 is also equipped with our original patented technology which corrects curling of printed receipts and allows users to give receipts in a straight state. 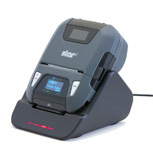 Star Micronics, which has a large share in the rapidly growing mobile POS market, will try to keep launching unique products which satisfy market needs to expand its share. Star will exhibit the SM-L300 at “RETAILTECH JAPAN” that will be held at Tokyo International Exhibition Center for 4 days from March 7 to March 10, 2017. We hope you will visit our booth to experience the demos for this printer, new innovative products for mobile POS market and digital receipts services. » Able to communicate using Bluetooth 4.0 (Bluetooth Low Energy) technology. » Able to charge via a charger for a smartphone, PC and a portable battery for a cell phone, no need of a dedicated battery adapter. » Equipped with a dual module which supports Bluetooth 3.0 / 4.0 (BLE) BLE communication for iOS devices and Bluetooth 3.0 high speed communication for other OSs. » The OS auto-detecting function eliminates panel operations to change OS setting. » Able to correct curling of printed receipts and allow users to give receipts in a straight state. » Star’s SDK facilitates developers in easily designing mobile applications without complicated communication control on diverse operating systems like Windows Mobile, Windows CE, iOS (iPhone, iPad, iPod) and Android. » The StarPRNT SDK is available on the APP Store, Google play and Windows Store. App Store is a trademark of Apple Inc. Google play is a trademark of Google Inc. Windows Store is a trademark of Microsoft Inc.
» For stationary installation, an optional charging cradle is available.